Conveniently store and charge two DUALSHOCK®4 controllers with Nyko's Charge Block Duo for PlayStation®4. 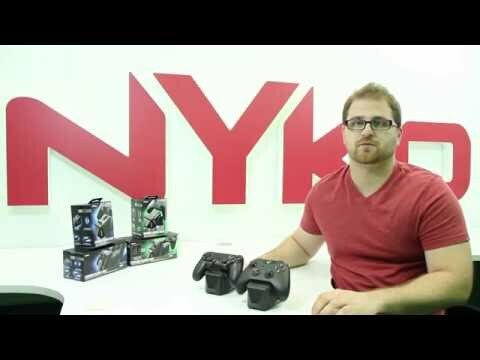 The Charge Block Duo for PlayStation®4 utilizes Nyko's patented dongle system that attaches to the Micro-USB port on the controller, leaving the ergonomics an grip of the DUALSHOCK®4 controller unchanged. This allows for easy drop and charge functionality - no additional cords, wires or plugs needed. Connect multiple Charge Blocks together from the same or different platform to create you own custom charger*. No more low batteries during extended gaming sessions. The low-profile design allows for the Charge Block to fit easily in most entertainment centers while the LED charge indicator keeps you notified of the charging status. 1. How do I know my controllers are fully charged? While charging the controllers on the Charge Block, the indicator will light up and blink while charging. Once the controller is fully charged, the indicator light will stay solid on the Charge Block. 2. How many Charge Blocks can I connect together? You can connect up to 4 Charge Blocks together from different platforms. Please Note: You will need to use a USB 3.0 connection to power more than 2 Charge Blocks.